The Book: Every season I receive a handful of cookbooks in the mail that weren’t previously on my radar. I don’t review everything that comes across my doorstep, but every once in a while I get a surprise gem that I never would have thought to look at otherwise. This fall, Duck & Waffle, the cookbook from the trendy London restaurant of the same name, was that unexpected treasure. Right away you can tell that this book is exceptionally creative: “Dossants” – croissants stuffed with amaretto donut cream? PB&J turned into french toast? Spicy ox-cheek filled doughnuts? I am so in. This book is packed with comfort food recipes but with fancy ingredients and flavors – so basically, right up my alley. As you might have guessed, this is not food for when you’re craving something light. In fact, the chef and author Daniel Doherty writes in his recipes for Grilled Cheese with Ox Cheek, “as always, feel free to add one of the magical three: bacon, more cheese, or hot sauce.” Words to live by. The breakfast and brunch chapter is where this book really shines, but there are some inspired dinner and dessert picks as well. Whatever time of day it is, flipping through Duck & Waffle is going to make you hungry. 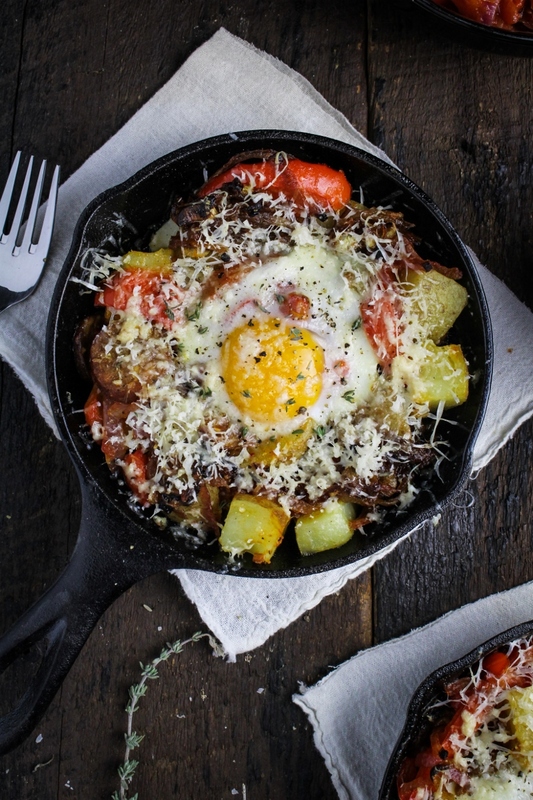 The Food: If a book has a recipe for something called “hangover hash,” how can you not make it? 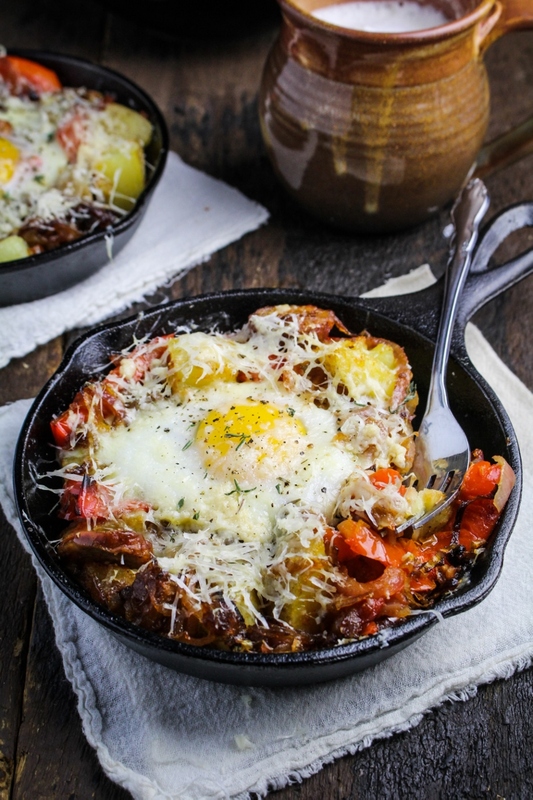 Whether or not you’ve had a bit too much to drink the night before, is there anything more appealing than a skillet full of potatoes, sausage, eggs, and cheese set in front of you on a lazy weekend morning? I’d argue there isn’t, unless of course you sweeten the pot with a piping hot mocha and a bowl of fresh berries on the side. 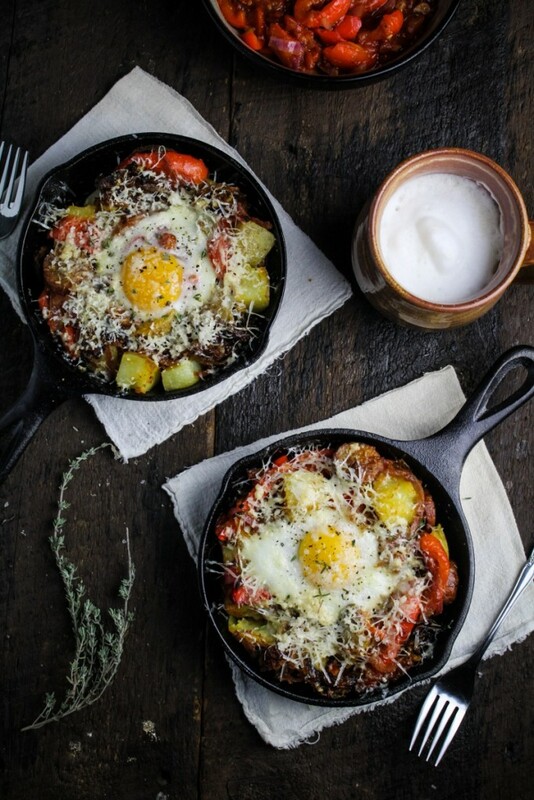 This hash would shine at any respectable brunch restaurant – it’s got potatoes, caramelized onions, an incredible tangy sauce of red peppers and tomato, chorizo, egg, and of course, a healthy handful of grated gruyere cheese. 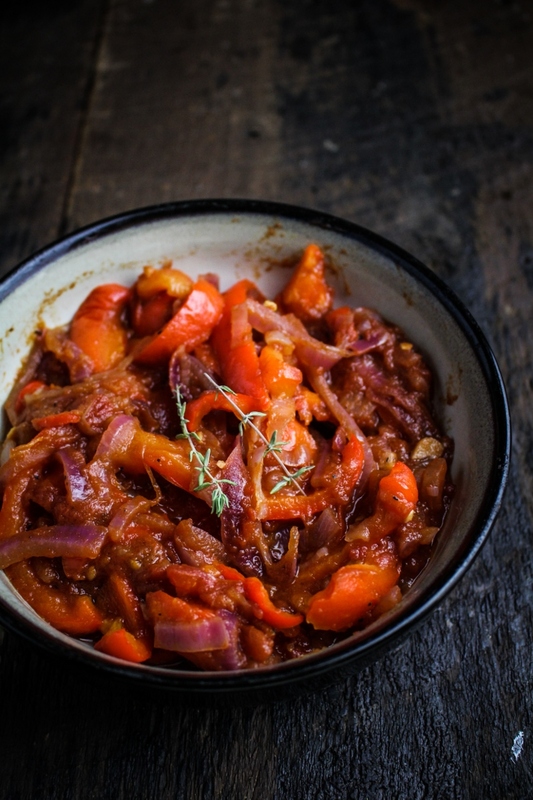 Both the caramelized onions and the peperonata take a long time to prepare, slowly sweating over low heat, but the pay-off is well worth the wait. The peperonata in particular is a flavor powerhouse – Doherty writes that he is never without a jar in his fridge, and I may have to follow suit. I will say that if you were actually hungover, making this would be altogether too daunting, at least as far as I can tell from my experience with hangovers and cooking. 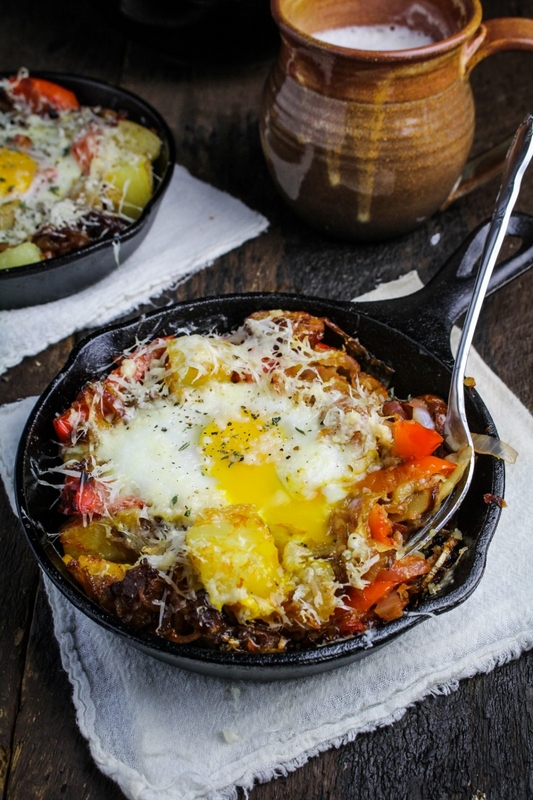 But if you’re planning ahead, then you’ll make the caramelized onions, peperonata, and boiled potatoes in advance, and the morning of all you’ll have to do is put everything in a skillet, put it in the oven, then lie back down and wait 25 minutes for it to be done. And once you’ve tried the basic recipe, it’s easy to riff on – I made my second batch with a fat spoonful of ricotta on top, and next time I think I’ll replace the caramelized onions with sauteed mushrooms. Disclaimer: I received a review copy of Duck & Waffle from Mitchell Beazley, but I was not otherwise compensated and all thought and opinions are my own. Recipe adapted slightly from Duck & Waffle. Serves 2. Place 2 TBS of the olive oil in a large skillet and heat over low heat. Add the sliced onions and bay leaf and toss to coat with the olive oil. Cook the onions over low heat until golden brown and caramelized all over, stirring every 3-5 minutes – this should take 40 minutes to 1 hour. If your onions are browning on the outside inside of turning golden, turn down the heat. Remove the bay leaf and season onions to taste with salt. Cut the potatoes into 1/2 inch cubes. Add to a saucepan and cover with cold water. Salt the water, then bring to a boil over medium-high heat. Boil for 10-15 minutes, until potatoes are tender when pierced with a fork, then drain. Preheat the oven to 350°F. 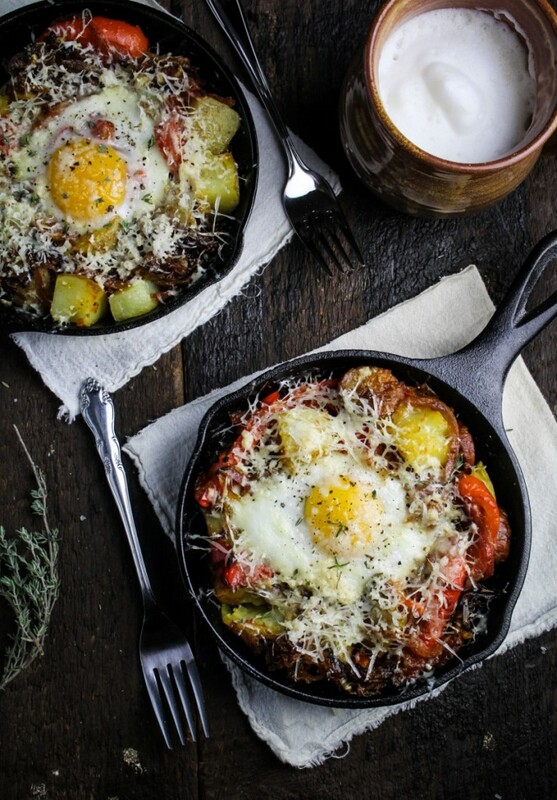 Divide the cooked potatoes and the sliced sausage between two 6 inch cast iron skillets. Drizzle with the remaining 1 TBS of olive oil. Bake the potatoes and sausage for 10 minutes, then remove from the oven and stir in the caramelized onions and peperonata. Bake for another 10 minutes, then crack one egg over each skillet and cover with grated cheese. Bake until egg white is cooked through, about another 8-10 minutes, then remove from the oven and serve immediately. Season to taste with salt and pepper. Recipe adapted slightly from Duck & Waffle. Makes about 4 cups. Heat the olive oil in a large saucepan, then add the peppers, onions, and garlic. Season to taste with salt and black pepper. Cook, stirring occasionally, until peppers and onions are soft, about 20-25 minutes. Add the tomatoes, bay leaf, thyme, brown sugar, and red wine vinegar and stir to evenly mix. Cook for another 10-15 minutes, until it has a semi-thick sauce consistency. Remove and discard the bay leaf and thyme stems, and store in a jar in the fridge. Hangover hash!!!! This is delightful!